The Packers organization is facing some tough decisions; namely the Donald Driver, and Matt Flynn situations. If you are reading this, I am sure you have seen one article after another pertaining to this dilemma; if not, the talk is the Donald may be done in Green Bay. 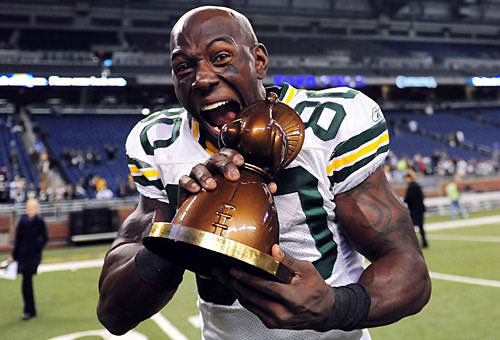 I am going to say a little about Donald Driver. Yes, I think we have a problem that is being twisted, and turned in such a way as put the blame on age, and declining skills that comes with age, rather than production. Donald Driver has played hurt, and been more productive than most receivers who have played the game. Production is more than catching a pass; it is leading by example, taking the punishing hits, while catching passes across the middle, and showing the younger players what it takes to be a winner. Here is an article that talks about the value of player stats. The Donald, in my opinion was not given the opportunity late in the season, for whatever reason, to contribute in helping the Packers. It was sad to see him on the bench, he knowing something that none of us knew at the time. The touchdown and no Lambeau leap! From Donald, Come on Man! This situation is similar in some ways; namely, the Brett Favre divorce, only Driver does not want to retire; on the contrary, he wants to play for three more years. I think Donald Driver is more than likely in better shape, than the younger receivers we all are reading about in the media. Whatever is going on behind the scenes? I hope it can be resolved in everyone’s best interest, so that one of the all-time Packer greats can go out in style; that is, with his head held high and when the time comes a Green Bay Packer! He didn't do the leap because it was a token touchdown. We were losing and the game was over. I sit in the front row in that endzone, he blew kisses to the fans and ran off with a smile. BrewersnPackers.com is not affiliated with MLB the NFL, Milwaukee Brewers or Green Bay Packers. Picture Window theme. Theme images by konradlew. Powered by Blogger.